Blizzard has revealed a ton of new information about the new Magnetic mechanic—including a handful of new cards that use the effect. Magnetic is the new keyword being added in The Boomsday Project, the next expansion for Hearthstone. Magnetic minions can be played as standalone minions, or attached to other Mechs as buff cards. In the video we learn a couple of key things about Magnetic. First of all, there will be Magnetic minions for three classes—Hunter, Paladin and Warrior. 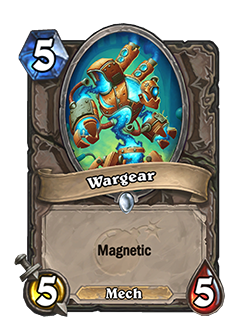 Sorry Mech Mage fans, you'll have to make do with neutral Magnetic Mechs. Secondly, Magnetic minions have "polarity" as Blizzard is calling it. Rather than a Choose One effect, where you place the minion dictates how it plays. If you play it on the right of an existing Mech it will just hit the board, but if you play it on the left they will combine. The video also revealed four new cards that make use of the mechanic. This card isn't Magnetic on its own, so it can't be used as a cheap stat buff for other Mechs. 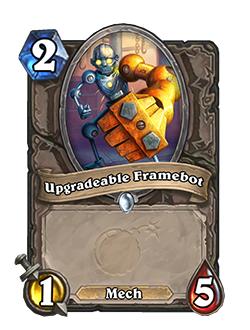 Instead it's intended to be used as a base for other Magnetic cards—hence the name Upgradeable Framebot. Wargear isn't particularly exciting, it's just a 5/5 for five mana—or a slightly upgraded Blessing of Kings. But it provides a little bit of flexibility when you're manipulating the stats of your mechs. Now things get a bit more interesting. 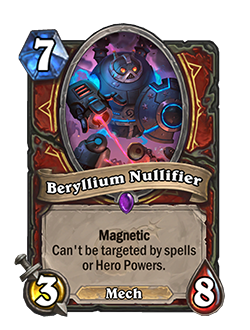 Beryllium Nullifier is a 3/8 Magnetic Mech for seven mana, and it also has spell shield. By the time you've added this, building a big mech is slightly less scary since it can't be removed by single-target removal spells. 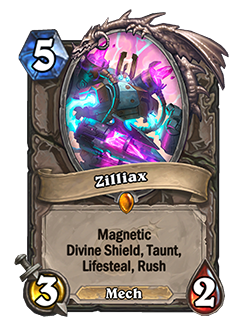 To get the full spectrum of Magnetic Mechs, here Zilliax. This card does a lot of work. For five mana it is only a 3/2, but it has five keywords—Magnetic, Lifesteal, Rush, Taunt, and Divine Shield. More cards will be revealed up until the eventual release of The Boomsday Project on Aug. 7.